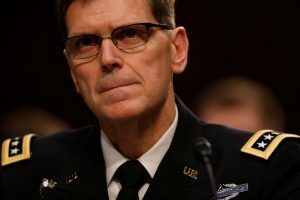 WASHINGTON — The top U.S. general for the Middle East says the military has launched a formal investigation to determine what role the U.S. played in the deaths of dozens of civilians in Mosul, Iraq. Gen. Joseph Votel, head of U.S. Central Command, says combat in the densely populated areas of Mosul is making it harder to avoid civilian casualties. Votel says the probe will look at what Islamic State militants did to contribute to the deaths, including use of human shields, on March 17. He says they’re exploiting America’s sensitivities about civilian deaths. Votel tells the House Armed Services Committee the combat situation is evolving. He says the investigation will review intelligence provided by Iraqi forces.